Unite’s mission is to organise people to strive for a society that places equality, dignity and respect above all else. But our union recognises that we can only achieve this if we bring people together from all walks of life. Even now in the 21st century, too many people in our country are being pushed to the margins of society. They deserve to be heard;they too deserve the support to organise collectively. 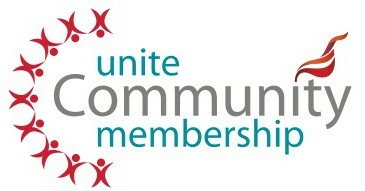 It is with this in mind that Unite has founded its community membership scheme. Unite’s community membership scheme brings together people from across our society. Those not in employment are welcomed into the union family, adding another dimension to our strength in thousands of workplaces across the UK. Organising and activism are at the centre of strong communities, which is why Unite’s community membership provides a way people can find and use their political voice. Whether it is taking a stand against a service closure or coming together to improve your living environment, as a community member, Unite will be on your side. These are seriously hard times for ordinary people. Incomes, housing, our health, education and legal services – the very pillars of our society for more than 60 years – are now under assault. It is only as standing together that we can defend and improve our lives. Through Unite’s community membership we will work with you to make life better; we will give you the platform you need to create a fairer society. Our trade unions are the biggest voluntary group in the UK. At 6.5 million strong, we are the Big Society. At Unite we have 1.5 million members – just imagine what you can achieve with them standing by your side? Unite Community Leeds Branch meets on the first friday of every month. Why not contact us at unitecommunityleeds@gmail.com and come on down to your first meeting.